It was November last year when I was suddenly overcome by a great surge of insanity. 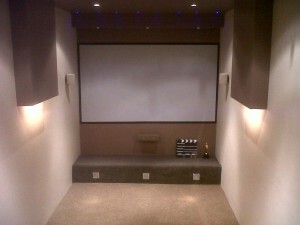 The result of this temporary turn of events was that I decided to convert my Garage in to a Home Cinema. But in my mind this was not going to be a standard home cinema. The plan was to mimick the look and feel of an actual cinema, but on a much smaller scale of course. I had decided on a seven foot screen, a full 1080P high definition cinema projector and a 5.1 suround sound experience, all running through a Denon AV receiver. The seating would be 2 tier so that the rear seats would be higher than the front seats and all the various Audio Visual devices would be controlled by a Harmony 1000 remote control, including the lighting. So, once programmed, with the press of a single button, the AV equipment will switch on and just as the film is about to start, the light will automatically dim and switch off. 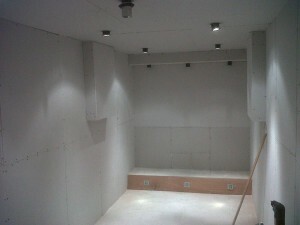 The Cinema will need to be thermally and acoustically insulated. 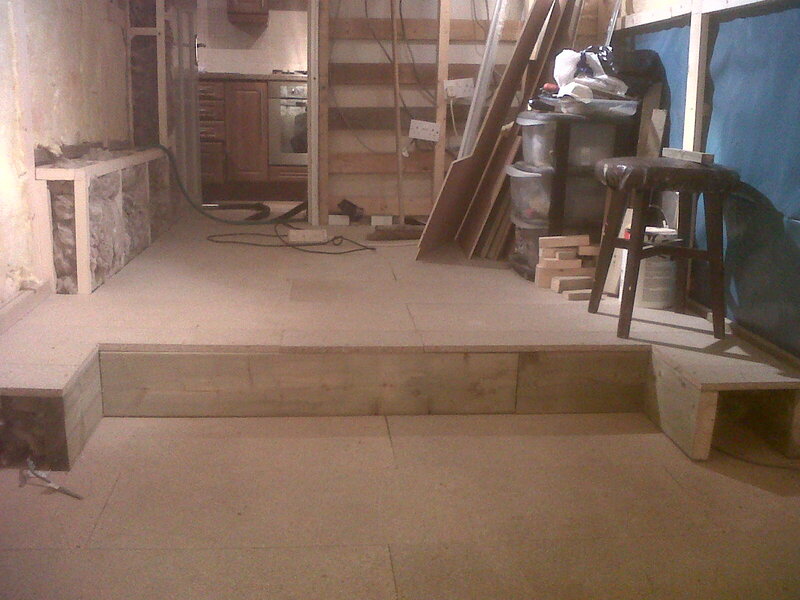 A damp proof membrane had to be applied, Floor joists and panels needs to be laid above the concrete floor. A wooden batton structure has to be constructed and screwed on the walls, New wiring has to be introduced, a new wall had to be built … Etc, etc, etc. The list was endless. When one looks at the state of my Garage, this was indeed going to be a monumental challenge. Even more so considering I have had no building experience whatsoever. ( Excluding my construction of the Empire state building out of Lego when I was 10). We all have these grand schemes now and again but invariably, sanity takes over and you soon realise that perhaps they were not meant to be. Well, seven months and a few cut and bruised fingers later and a much lighter bank balance, my insanity had remained intact throughout, and my Cinema was finally completed. 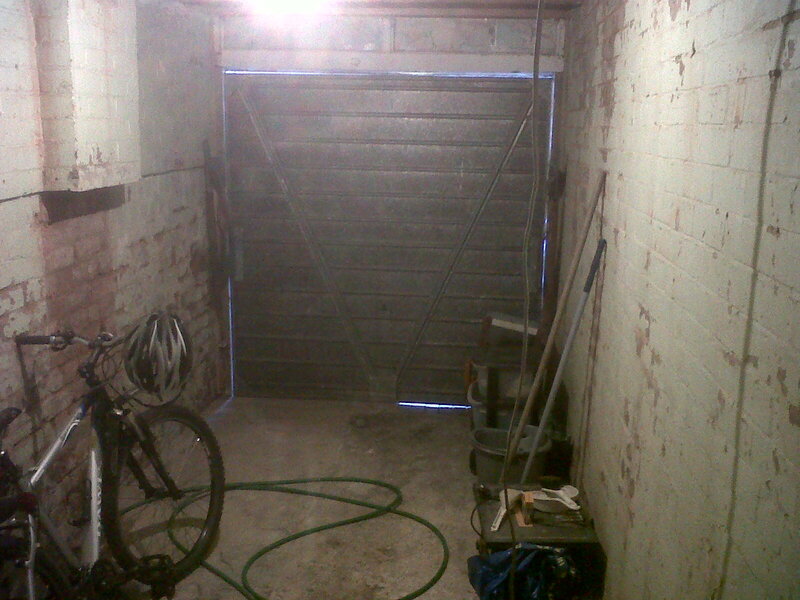 The before shot, showing concrete floor and brick walls. Two tier seating, note the raised floor for the rear seating. After much sweat and tears the plasterbords are up. The Finished article with a seven foot screen and mood lighting. Absolutely brillaint! If only I had the space at home to do something like that! And of course the patience to put it all together.